« From $268,900! New Vancouver BLOCK 100 Condos in Southeast False Creek Waterfront District by Onni! Affordable False Creek Block 100 Vancouver Townhomes & Waterview Condos for Sale! 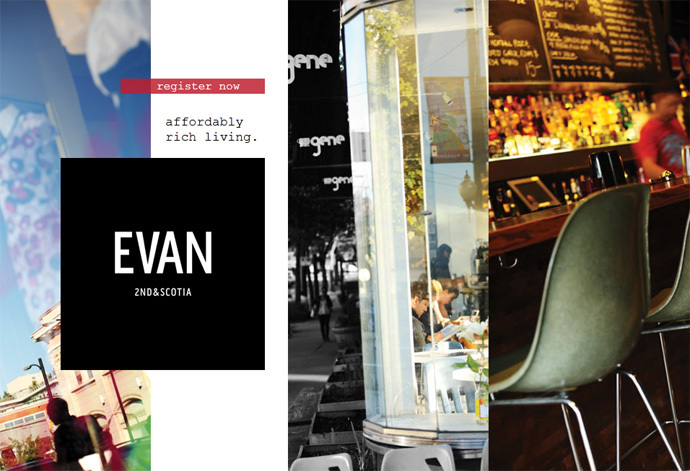 EVAN Vancouver Condos at 2nd & Scotia in SOMA District! The estimated completion date for the False Creek EVAN Condos is for Spring 2014 and the deposit structure is very good for new home buyers with an amazing 5-5-5% deposit structure available for a limited time offer. For Southeast False Creek investors looking at the presale Vancouver EVAN condo project, 1 bedroom homes in the area are renting for about $1,450 per month on average. 2 bedroom rentals are from $1,950 per month. EXCITING NEWS! 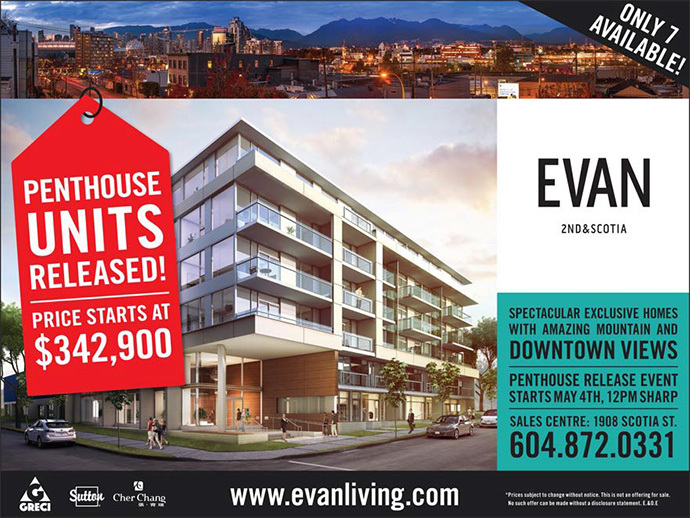 Vancouver’s EVAN Penthouses Released! Only 7 penthouse suites at EVAN Living are available. Price starts at only $342,900. The exclusive Vancouver EVAN penthouse units are released. Each unit has spectacular downtown and/or mountain view. There is a keen focus on sustainability at this new Greci Group project with low flow fixtures and water efficient landscaping throughout the property. In addition, the new False Creek EVAN Vancouver condos for sale will feature high efficiency Energy Star rated front loading washer and Energuide rated dryer and energy efficient appliances in the kitchen. Other sustainable features at the presale Vancouver EVAN False Creek condos include low VOC paints, sealants, adhesives and ample window glazing (windows are operable too) in addition to recycling and garbage collection facilities. The modern 6 storey concrete False Creek midrise in the most exciting new neighbourhood in SOMA Vancouver real estate market will also feature patios and/or balconies for all homes and over height ceilings in all homes. There are frosted glass sliding doors in one bedrooms and bike lockers. The presale Vancouver EVAN False Creek condos also present a unique integrated indoor and outdoor amenity space, including artists studio and workshop. All homes at the False Creek EVAN Vancouver condo building will come with the 2-5-10 year comprehensive home warranty and there is an artist studio/workshop on site as well as a lush professionally landscaped courtyard. The solid reinforced concrete construction offers superior durability to wood framed buildings and the EVAN SOMA condo building is accessible through security key fob access. There is underground parking that is well lit and secured and enterphone system at the building entry. Located at 1908 Scotia Street Vancouver, the False Creek EVAN Condos are centrally located within one of the most promising and exciting new communities in the entire Lower Mainland. Just within minutes walking distance to the SkyTrain station as well as Telus Sphere/Science World and the False Creek seawall, the EVAN Vancouver False Creek condos for sale are all about accessibility and outdoor living. As well, home owners at the False Creek Vancouver EVAN condos will be just a quick stroll to Emily Carr, the Great Northern Way as well as Main Street amenities and services. Some call is False Creek and others call it the Vancouver SOMA District (SOMA stands for South of Main) and you are literally steps away from the East Vancouver’s cultural epicentre, downtown Vancouver, Chinatown, Gastown and much more. This concrete mid-rise will offer only 55 homes for sale in the SOMA Vancouver real estate district, many of which have amazing North Shore mountain views as well as courtyard views. The contemporary interior design color schemes are well thought out and professionally selected just for you! The homes will have premium wide plank laminate floors in the bedrooms, dining and living areas for that truly modern appeal in addition to painted flat panel interior doors and high efficiency energy star front loading washer and dryer in laundry closets. Also, the new SOMA Vancouver EVAN apartments for sale will have multiple outlets for high speed internet access and digital media. The beautiful bathrooms at the new SOMA Vancouver EVAN apartments for sale will include polished chrome accessories, contemporary/minimalistic soaker tub with single lever pressure balanced valve for the shower in addition to high efficiency dual flush toilet and large format porcelain tile tub surround. Other bathroom features at the presale Vancouver EVAN Apartments South of Main include sleek polished composite counters with four inch back splash, flat panel graphite teak vertical grain laminate cabinetry with stainless steel modern hardware and convenient soft closing mechanisms for all doors. The kitchens at the new EVAN Vancouver apartments for sale will include premium energy efficient European designed appliance package (including fully integrated bottom mount fridge, 24” stainless steel convection electric wall oven, 24” ceramic top electric cooktop, dishwasher that is fully integrated, 24” slide out fan and stainless steel microwave). All kitchens also have in sink disposalnits in addition to contemporary white gloss lacquer upper cabinets and custom flat panel modern graphite teak vertical granite lower cabinetry (like the bathrooms). Other gourmet kitchen features at the new SOMA Vancouver EVAN apartments include functional under cabinetry lighting, convenient soft closing mechanisms for all cabinetry doors and stainless steel under mounted sink. Most of the larger homes also have large walk in closets in the masters. Over height ceilings are standard and all homes have outdoor living space. Please note that these finishes are subject to change. More information at www.evanliving.com. All images from evanliving.com. LET’S TALK NUMBERS > VANCOUVER EVAN CONDOS HAS IT ALL! Thinking about investing in a Vancouver condo? 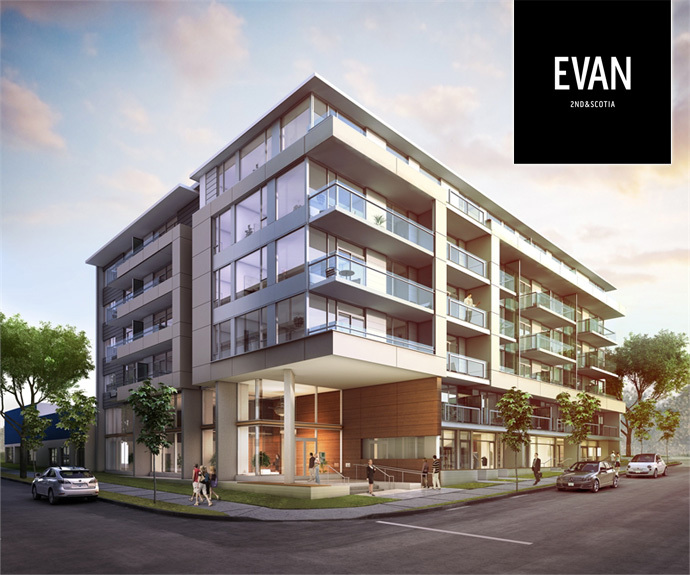 Come to the sales centre and speak with one of the sales representatives to see why EVAN Vancouver condos for sale is such a great property investment. Interest rates are still at a historical low. Why not hedge against inflation by owning an extra income-generating property at EVAN Vancouver condos with the potential of appreciation? The presale Vancouver EVAN condo building is close to international colleges, schools, public transportation, and has easy access to downtown. The Vancouver real estate neighbourhood is abuzz with Emily Carr school relocating two blocks down the street, major art galleries opening up in the area, and high tech companies such as Hootsuite moving up the road. With a fantastic Vancouver rental market opportunity – Get in early!